It’s also a big advantage if your tote is small enough to fit under an airplane seat, although if it’s your only item, you can stow it in an overhead compartment. The main cavity should hold one or two days’ worth of clothes for a short trip. Find one with a built-in organizer so you don’t have to dig around to find your keys, business cards, electronics, and charging cables. 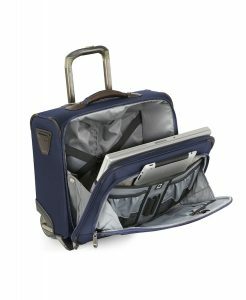 We even have models that can carry a laptop, tablet, or important documents that you can access without unzipping the entire bag. Some totes are also available with wheels, so make sure you’re happy with the way they roll. Our Crew 11 Spinner Tote comes with our patented MagnaTrac™ self-aligning wheel system, which ensures it rolls straight as you push through the terminal. We also included our Powerscope Extension Handle with the ergonomically designed Contour Grip. This handle system is so sturdy it can support the weight of another case or handbag. Totes are a convenient way to travel without carrying a lot of gear and stuff. They’re useful for short trips, or for carrying essentials when you have to check a large suitcase. If you don’t want to carry a briefcase or sling a backpack over your shoulder, consider a tote as an alternative. What do you do when you have a short trip, or just want to carry a small bag? Have you used totes before, or do you have a different method? Share your experiences with us in the comments below, on our Facebook page, or in our Twitter stream.